McDonald's Corporation is the warld's muckle maist cheen o fast-fuid restaurants. Altho McDonald's didna cleck the hamburger nor fast fuid, its name haes become naur-haund synonymous wi baith. Irn-Bru is selt bi McDonald's in Scotland. McDonald's haes been the subject o creeticism for alleadgances o exploitation o entery-level wirkers, ecological ratch duin bi agricultural throu-pittin an industrial processin o thair products, sellin ill fuid, throu-pittin o packagin redd, exploitative adverteesin (aft aimed at bairns, minorities, an laich-income fowk), an inpittin tae skaithin bestial. ↑ Bomkamp, Samantha (June 13, 2016). "Mcdonald's HQ Move Is Boldest Step Yet in Effort to Transform Itself". Chicago Tribune. Retrieved May 1, 2017. ↑ "Enrique Hernandez, Jr". McDonalds.com. 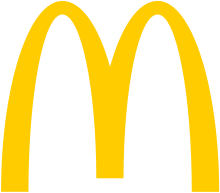 ↑ "McDonald's Corporation 2017 Annual Report Form (10-K)" (PDF). United States Securities and Exchange Commission. February 23, 2018. Retrieved August 21, 2018. ↑ null. "McDonald's Is King Of Resaurants In 2017 – pg.1". Forbes. Retrieved December 12, 2017. Wikimedia Commons haes media relatit tae McDonald's. This page wis last eeditit on 13 Februar 2019, at 05:20.